they benefitted from advice and practical activities from five major rural consultancies and have chosen to continue meeting and learning together. 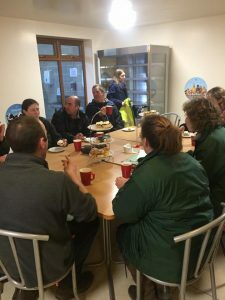 The group meet at each others farms to share good practice and inspire each other, during November we have met at Matlock Meadows at Masson Farm Snitterton where local farmer Mick Dakin showed us around his fantastic Ice Cream Parlour. October 4th 2018 the fund saw our last alumni session which was an inspiring marketing session with Tori and Bens Farm from Melbourne.